This tab is only for advanced users on complex networks. Most VPOP3 users will not need to enter any settings on this tab and can safely ignore it! This tab allows you to set the behaviour of the Authentication-Results header which is defined in RFC 5451. If you don't know what this header is, then you probably do not need to change any settings on this page! The Authentication-Results header contains the results of various SMTP message authentication checks, such as SPF, DKIM and SMTP authentication. The header field has a standard format which is defined in the above RFC. The Authentication ID field of the header indicates who added the authentication header. This is described in RFC 5451 section 2.3. The default is that VPOP3 will use the host name specified in the Misc Settings which will be perfectly acceptable in most situations. The only time you may need to change this is if you have a system with several mail servers and you want them all to use the same Authentication ID so that other mail servers know to use the Authentication-Results header added by those mail servers. 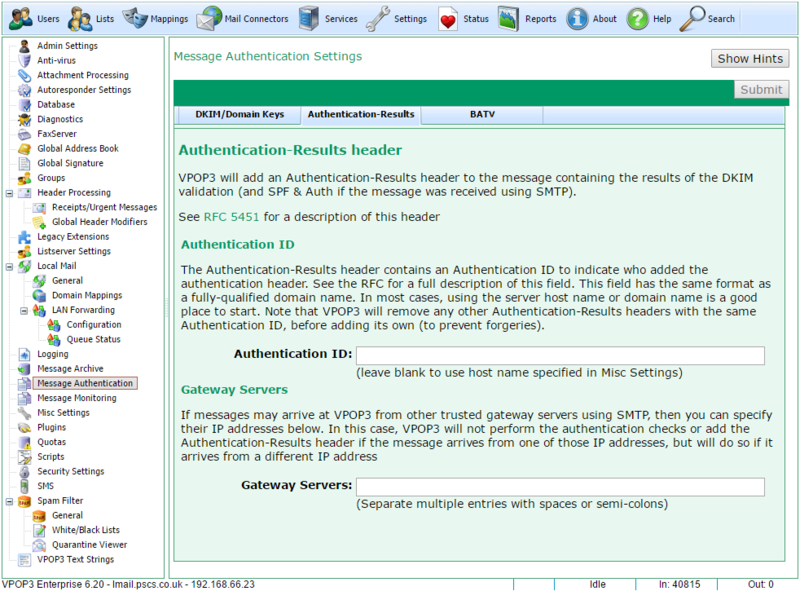 The Gateway Servers setting tells VPOP3 not to perform authentication checks or add the Authentication-Results header if the message arrives at VPOP3 using SMTP from one of the specified IP addresses. This can be useful if messages arrive via a chain of SMTP servers; except for the "border MTA" other servers will not see the original sender IP address so cannot perform SPF checks, for instance.